Should you buy the Canon EOS 5D Mark III? Is the 5D Mark III, 5D Mark II or 1DX best for you? Canon EOS 5D Mark III, 5D Mark II or 1DX - which will you buy? For photographers looking for a replacement for a well-used Canon EOS 5D Mark II, the introduction of the Canon EOS 5D Mark III is a welcome option indeed. But we're not sure it has made our new buying decision any easier. And for those seeking an upgrade from a lesser DSLR, is the 5D Mark III worth the extra money over the Mark II, or should you go the whole hog and buy a Canon EOS-1DX? The Canon EOS 5D Mark II is a nice middle ground between entry-level DSLRs and full professional models, and available for about £1,700 in the UK or $2,200 in the US, it represents really good value. The new 5D Mark III, with a UK price of £3,000 and US price of $3,500, seems to have migrated upward toward the £5,300 1DX flagship product. Yes, it's slower than the 1DX, but the 5D Mark III does inherit its 61-point AF system, as well as its new DIGIC 5+ chip, and the sensor makes use of the same gapless micro-lens technology. The difference between 18 and 22 megapixels from the 1DX to the 5D Mark III is almost meaningless, except that the 1DX gets almost a one-stop advantage over the 5D Mark III in terms of noise floor. The improvement in weatherproofing and build strength from the 5D Mark II is welcome, since that's the principal shortcoming of the older camera. The electronic level is a feature on both new the Canon EOS 5D Mark III and Canon EOS-1DX, as is a 100% viewfinder and the 3.2-inch clearview screen, which are all good improvements. We would have loved the 5D Mark III's screen to be articulated to make it easier when shooting at ground level, though. Canon EOS 5D Mark II: This camera produces proven quality images at a good price point, so for those landscape photographers who shoot in Manual model and focus using Live View it's still a great first choice, and isn't being discontinued. Canon EOS 5D Mark III: The new Canon EOS 5D Mark III is a real upgrade in terms of AF and 6fps, so if you shoot landscapes or people as well as nature or sports, and only want one camera body, this is the model for you. Canon EOS-1DX: There's really not that much gain now over the 5D Mark III unless you absolutely need the blazing speed of 14fps or you just want the very best. But is it really worth paying nearly twice as much just for that? You could buy a Canon EOS 5D Mark II and a Canon EOS 7D and still have change left over from the price of a Canon EOS 5D Mark III. This combination not only gives you a backup body, but offers you the advantages of a full-frame camera for studio and landscape work (5D Mark II) and a quick camera for sports and nature photography (7D) as well as a 1.6x magnification factor. This is something neither of the new Canon camera bodies can match. It's worth remembering that not too long ago the 5D Mark II and the 7D were the new models Canon were pushing and we were eager to buy, and they still capture the kind of great images now that they did when they were introduced. 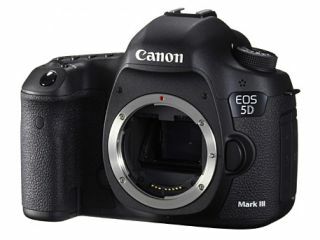 We've heard that a $300 discount is going to be offered in the US on the 5D Mark II. If a similar discount arrives in the UK, it would make the camera an even better idea.